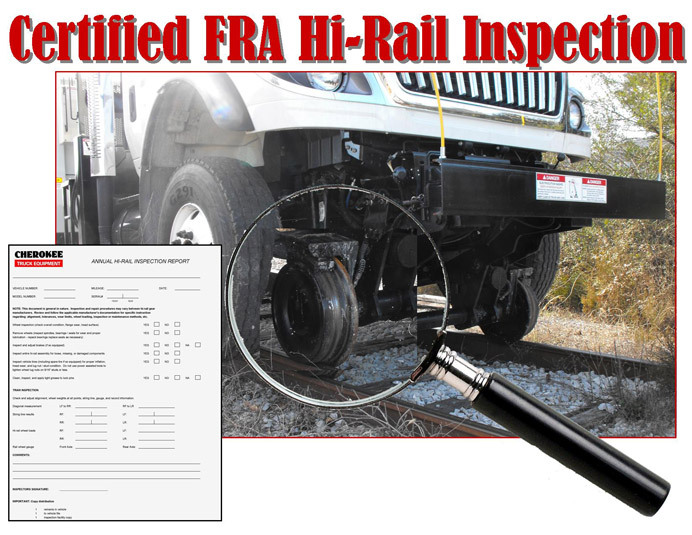 Cherokee Truck Equipment is a Certified FRA Hi-Rail (Hy-Rail, High Rail, Rail Gear) Inspector. We invite you to bring your Hi-Rail truck or vehicle to our Tennessee or Georgia Shop for a thorough inspection. Additionally, we offer two mobile service units that can also conduct FRA Certified Hi-Rail Inspections. These Vehicles can reach you in the feild & have conducted Hi-Rail Inspections & related services for Railroad Customers throughout Alabama, Georgia, Kentucky, Louisianna, North Carolina, South Carolina, Tennessee & Virginia. Come get your Hi-Rail Inspection & Service today!